در این مقاله یک روش عددی به منظور پیش‏ بینی رشد ترک در ورق‏ های چند لایه مرکب توسعه داده شده است. برای محاسبه دقیق تنش های بین لایه ‏ای، تئوری لایه ‏گون ردی به کار گرفته شده و صحت نتایج بدست آمده به کمک نرم افزار اجزاء محدود آباکوس تأیید گردیده است. سپس قابلیت حل مسائل در حضور جدایش بین لایه ‏ای، به عنوان مهم‏ترین عامل خرابی مواد مرکب، به مدل اضافه شده است. 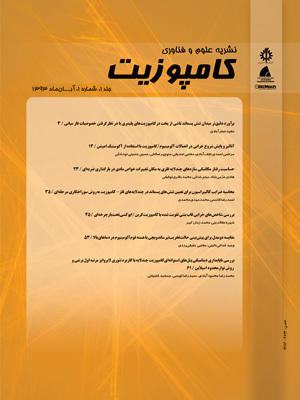 در ادامه روش عددی انتگرال جی، به عنوان یک انتگرال مستقل از مسیر، برای ترک‏ های صفحه‌ای بین لایه‌ای در چند لایه‏ های مرکب معرفی شده و با استفاده از آن مدل لایه ‏گون ابتدایی تکمیل گردیده است. همچنین رشد آسیب در سازه با نرخ رهایی انرژی کرنشی کنترل می‏ گردد؛ به این صورت که در ابتدا روش محاسبه ماتریس سختی کل سازه به وسیله ‏ی المان لایه‏ گون بیان گشته و جابجایی‌های گره‏ ای و میدان تنش-کرنش در المان‌ها استخراج می‏ گردد. سپس با محاسبه ‏ی انتگرال جی سه بُعدی، امکان پیش‌بینی رشد ترک به کمک معیار نرخ رهایی انرژی کرنشی لبه‏ ی ترک، به دست می ‏آید. در انتها به منظور اعتبارسنجی مدل ارائه شده، نتایج بدست آمده با نتایج مدل‏ های موجود مقایسه گردید و مشاهده شد که در عین منحصر به فرد بودن، با برخی از مدل ‏های تحلیلی قرابت بیشتری دارد. 2Aerospace department, Sharif University of technology, Tehran, Iran. 3Aerospace department, Sharif University of technology, Tehran, Iran. In this paper, a numerical method is developed in order to predict the crack growth in multi-layerd composites. Reddy's layerwise theory is em employed to truly calculate the the interlaminar stresses and afterward the accuracy of results are satisfied by Abaqus finite element software. Then the capability of solving problems in the presence of delamination, as the most important cause of composites failure, is added to the elaborated model. In fallows, the J-integral method, which the integral is independent of the path around a crack, is introduced and by using the this method, the initially layerwised model is improved. Also, failure in structure is controlled by strain energy release rate; This means that firstly the process of computing total stiffness matrix of structure using layerwise element is described and nodal displacements and stress-strain fields in elements are extracted. Subsequently the possibility of predicting the crack growth is achieved by calculating the 3D J-integral using the criterion of strain energy release rate at crack front. Finally, the developed numerical model is validated by comparing the its results with the results of available analytical models and it is perceived that the model, despite being unique, is more similar to some of the analytical solutions. Puppo, AH. and Evensen, HA., "Interlaminar Shear in Laminated Composites Under Generalized Plane Stress" Journal of Composite Materials, Vol. 4, pp. 204-220, 1970. Becker, W., "Closed-Form Solution for the Free-Edge Effect in Cross-Ply Laminates" Composite Structures, Vol. 26, pp. 39-45, 1993. Wang, ASD. and Crossman, FW., "Calculation of Edge Stresses in Multi-Layer Laminates by Sub-Structuring" Journal of Composite Materials, Vol. 12, pp. 76-83, 1978. Lessard, LB., Schmidt, AS. and Shokrieh, MM., "Three-Dimensional Stress Analysis of Free-Edge Effects in a Simple Composite Cross-Ply Laminate" International Journal of Solids and Structures, Vol. 33, pp. 2243-2259, 1996. Chung, S., “Effects of Interlaminar Stress Gradients on Free Edge Delamination in Composite Laminates,” Ph.D Thesis, Drexel University, USA, 2003. Diaz, AD., Caron, JF. and Carreira, RP., "Software Application for Evaluating Interfacial Stresses in Inelastic Symmetrical Laminates With Free Edges" Composite Structures, Vol. 58, pp. 195-208, 2002. Lorriot, T., Marion, G., Harry, R. and Wargnier, H., "Onset of Free-Edge Delamination in Composite Laminates Under Tensile Loading" Composites Part B: Engineering, Vol. 34, pp. 459-471, 2003. Rice, JR., "A Path Independent Integral and the Approximate Analysis of Strain Concentration by Notches and Crack" Journal of Applied Mechanics, Vol 35, pp. 379-386, 1968. Hutchinson, J., "Singular Behaviour at the End of a Tensile Crack in a Hardening Material" Journal of the Mechanics and Physics of Solids, Vol. 16, pp. 13-31, 1968. Rice, JR. and Rosengren, GF., "Plane Strain Deformation Near a Crack Tip in a Power-Law Hardening Material" Journal of the Mechanics and Physics of Solids, Vol. 16, pp. 1-12, 1968. Shih, C. and Hutchinson, J., "Fully Plastic Solutions and Large Scale Yielding Estimates for Plane Stress Crack Problems" Journal of Engineering Materials and Technology, Vol. 98, pp. 289-295, 1976. Amestoy, M., Bui, H. and Labbens, R., "On the Definition of Local Path Independent Integrals in Three-Dimensional Crack Problems" Mechanics Research Communications, Vol. 8, pp. 231-236, 1981. Hakimelahi, B. and Soltani, N., "3D J‐Integral Evaluation Using the Computation of Line and Surface Integrals" Fatigue & Fracture of Engineering Materials & Structures, Vol. 33, pp. 661-672, 2010. Mollón, V., Bonhomme, J., Viña, J. and Argüelles, A., "Theoretical and Experimental Analysis of Carbon Epoxy Asymmetric DCB Specimens to Characterize Mixed Mode Fracture Toughness" Polymer Testing, Vol. 29, pp. 766-770, 2010. Gong, X., Hurez, A. and Verchery, G., "On the Determination of Delamination Toughness by Using Multidirectional DCB Specimens" Polymer Testing, Vol. 29, pp. 658-666, 2010. Schön, J., Nyman, T., Blom, A. and Ansell, H. "A Numerical and Experimental Investigation of Delamination Behaviour in the DCB Specimen" Composites Science and Technology, Vol. 60, pp. 173-184, 2000. Naghipour, P., Bartsch, M., Chernova, L., Hausmann, J. and Voggenreiter, H., "Effect of Fiber Angle Orientation and Stacking Sequence on Mixed Mode Fracture Toughness of Carbon Fiber Reinforced Plastics: Numerical and Experimental Investigations" Materials Science and Engineering: A, Vol. 527, pp. 509-517, 2010. Avidson, BD. and Gharibian SJ., "Evaluation of Energy Release Rate-Based Approaches for Predicting Delamination Growth in Laminated Composites" International Journal of Fracture, Vol. 105, pp. 343–365, 2000. Pereira, A., Morais, AD., Moura, MD. and Magalhães, A., "Mode I Interlaminar Fracture of Woven Glass/Epoxy Multidirectional Laminates" Composites Part A: Applied Science and Manufacturing, Vol. 36, pp. 1119-1127, 2005. Rehan, MM., Rousseau, J., Gong, X., Guillaumat, L. and Ali, J., "Effects of Fiber Orientation of Adjacent Plies on the Mode I Crack Propagation in a Carbon-Epoxy Laminates" Procedia Engineering, Vol. 10, pp. 3179-3184, 2011. Reddy, JN., “Mechanics of Laminated Composite Plates and Shells: Theory and Analysis” Second ed., CRC Press, Florida, pp. 740-742, 2004. Krueger, R., "Virtual Crack Closure Technique: History, Approach and Applications" Applied Mechanics Reviews, Vol. 57, pp. 109-143, 2004. Zou, Z., Reid, S., Li, S. and Soden, P., "Application of a Delamination Model to Laminated Composite Structures" Composite Structures, Vol. 56, pp. 375-389, 2002. Morais, AD., Moura, MD., Gonçalves, J. and Camanho, P., "Analysis of Crack Propagation in Double Cantilever Beam Tests of Multidirectional Laminates" Mechanics of Materials, Vol. 35, pp. 641-652, 2003. Kanninen, M., "A Dynamic Analysis of Unstable Crack Propagation and Arrest in The DCB Test Specimen" International Journal of Fracture, Vol. 10, pp. 415-430, 1974. Kondo, K., "Analysis of Double Cantilever Beam Specimen" Advanced Composite Materials, Vol. 4, pp. 355-366, 1995. Ozdil, F. and Carlsson, L., "Beam Analysis of Angle-Ply Laminate DCB Specimens" Composites Science and Technology, Vol. 59, pp. 305-315, 1999. Shokrieh, MM., Rarani, MH. and Ayatollahi, M., "Calculation of GI for a Multidirectional Composite Double Cantilever Beam on Two-Parametric Elastic Foundation" Aerospace Science and Technology, Vol. 15, pp. 534-543, 2011.